This piece is the continuation of the bead crochet series, a second generation as many changes have been done in the actual technique. The beads are held in place with a tighter crochet technique, though the overall impression is still of a fisherman net. 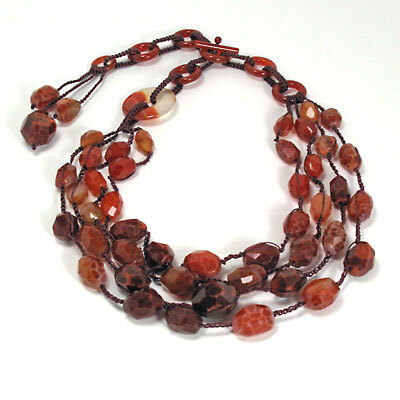 This piece is made with fire agate beads with faceted sides, carnelian rings and toggle bar. The toggle can be inserted in any of five rings to adjust the length of the neckpiece. The back tassel can be worn hanging on the back or worn draped on the side of the neck. The color of the thread is best described as a deep sienna, or tuscan red. 30mm Carnelian Donut. Fire Agate Faceted Beads. Carnelian rings and toggle. Nylon cord. This series got started with turquoise nugget beads.Look for an update soon as I just got some beautiful new beads in.